1. A freshwater fishing licence. Due to limited access points and steep banks, most people fish from a boat . As far as I know, there are no Freshwater Fishing Guides. No company that I know of rents boats. However, lots of people rent kayaks and bring them up to the lake. Several anglers use "belly boats", float tubes. 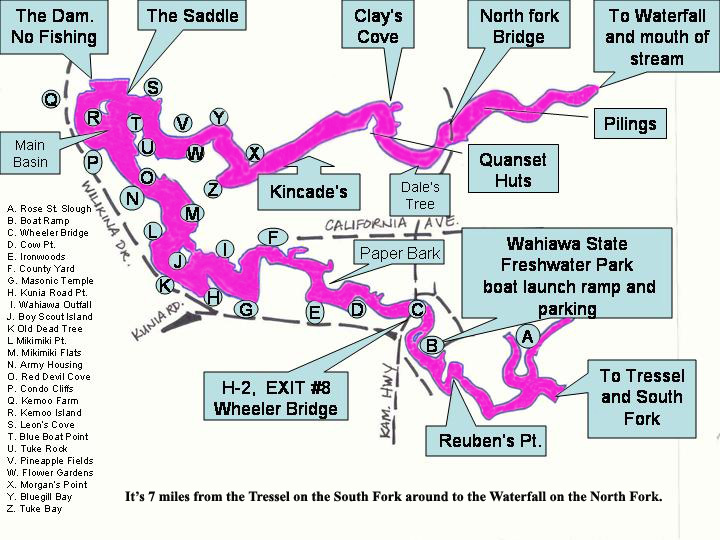 The Wahiawa State Freshwater Fishing Park (on your GPS or Google Earth) has a boat ramp, parking, picnic tables, restrooms, and access for shore fishing. The park is open daily from 7:00 AM till dusk. To check the water level of Lake Wilson.... just click on the "Water Gauge" Link below. When the water level is way down.... it is much easier to fish from shore at other locations around the lake..
One area I see lots of people fishing is accross from Schofield Bks....... starting at Kunia Road and moving north. There is plenty of parking all along the road next to the lake. See.......... "L", "K", and "H" on the map. 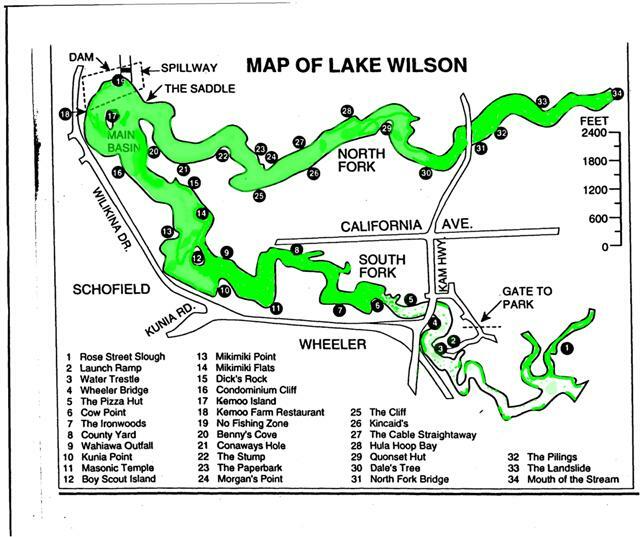 Here is the origional map of Lake Wilson from the Hawaii Freshwater Fishing Associan.